We have seen some superb lenses from Fujifilm and the first impression of this new lens looks equally as promising as it is impressive, dwarfing the Fujifilm X-H1 body used for the review. It is big and chunky, as we might expect from a 200mm lens with a super-fast, bright f/2 maximum aperture. Also included in the package is a 1.4x teleconverter, adding a useful extension to the focal length whilst hardly changing the dimensions of the main lens and camera body. Let's dip our toe in the water, perhaps literally as we venture out into the gales and rain, to see what this beast of a lens can do. The manufacturer quotes the weight as 2265g, which seems to be including caps. As I measure it, the lens alone weighs 2240g and with hood attached 2460g. The large hood is secured with a screw, being attached simply by pushing it straight onto the front of the lens. The attachment is secure. Within this, there is a large, standard filter thread of 105mm, which gives a good idea of just how chunky the lens actually is. 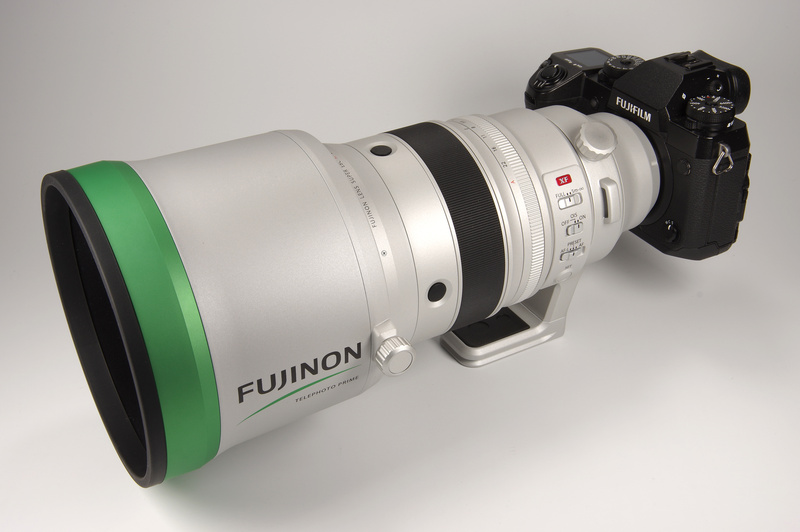 The hood has a sliding panel that makes it possible to access rotating filters, such as polarisers. Thus the filter can be rotated without removing the hood. However, despite the appearance of bulk, the lens actually balances and behaves very well in conjunction with the camera body. It can be happily used hand held for quite a while, although for prolonged periods of use a camera support may be helpful. There are four equally spaced buttons around the lens barrel, and these are used in conjunction with the focus preset function. They simply recall whatever focus point is set, ideal for returning to a fixed point in action and wildlife photography in particular. The manual focus ring is electronic and totally smooth in operation. 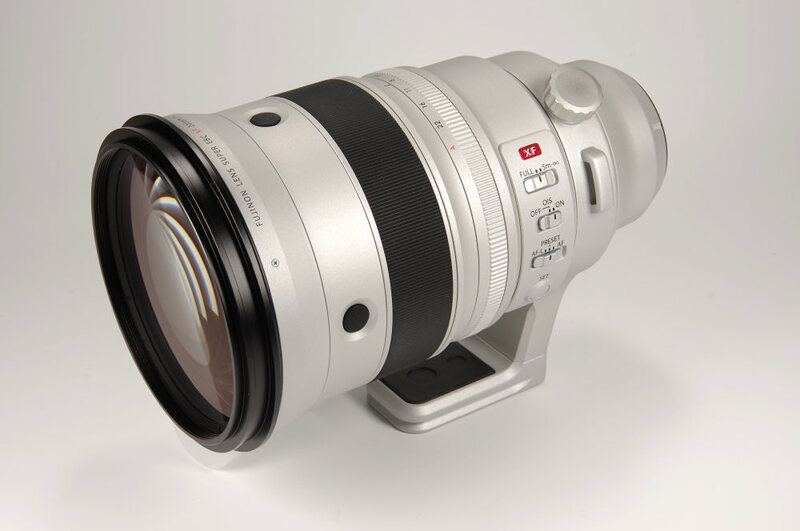 Focusing of the lens is down to 1.8m (5.9 feet), a maximum magnification of 0.12x. This is reasonably close for a medium to long range lens. AF is fast, silent and efficient, operated via twin linear motors. The large aperture ring is beautifully damped and click stopped in one third stop intervals. If preferred, the ring can be set to A and the aperture controlled by the camera. Different photographers will choose the system they prefer, but I will say that the aperture ring works very well ergonomically. The actual aperture comprises 9 rounded blades, for improved bokeh. Three switches and a button encircle the lens barrel. The focus limiter gives the choice of limiting AF operation to between 5m and infinity. The OIS system, claimed to have a 5 stop benefit, simply has on/off options. Fujifilm says that the system can work out whether we are photographing a still subject or are panning, and adjusts itself accordingly. The instruction manual also says that the system should be left on when on a tripod as it can reduce vibration from the mechanical shutter itself. This seems to be true, but for very precise composition it may still be better to switch the IOS off; with it on the image drifts slightly until it locks. The final switch selects AF-L, Preset and AF. If the preset position is selected, then the preset focus position can be recalled by pressing any of the focus control buttons. The focus position is recalled by the four buttons at the front of the lens. The focus position is set using the set button and this works in any AF mode. There is a rotating tripod collar, secured by a knurled screw, and an ARCA-Swiss compatible tripod mount. These cannot be removed. At this point, there are also two strap lugs, for added security when out and about. There are both 1/4” and 3/8” tripod mount screws. Optical construction is 19 elements in 14 groups, including 1 Super ED (Extra Low Dispersion) and 2 ED elements. The front element is Fluorine coated to repel dust, grease and moisture. The lens also has 17 seals and is rated as Weather Resistant. It is also able to operate in cold condition, down to -10C. 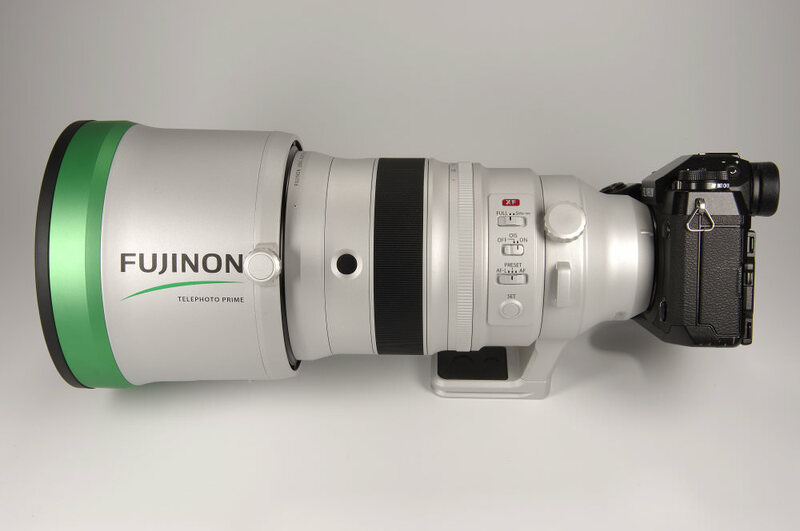 The XF 1.4x TC F2 WR teleconverter, also weather resistant, is included in the package. It only adds 130g to the overall weight and results in a focal length of 280mm. It comprises 7 elements in four groups, one of which is aspherical. 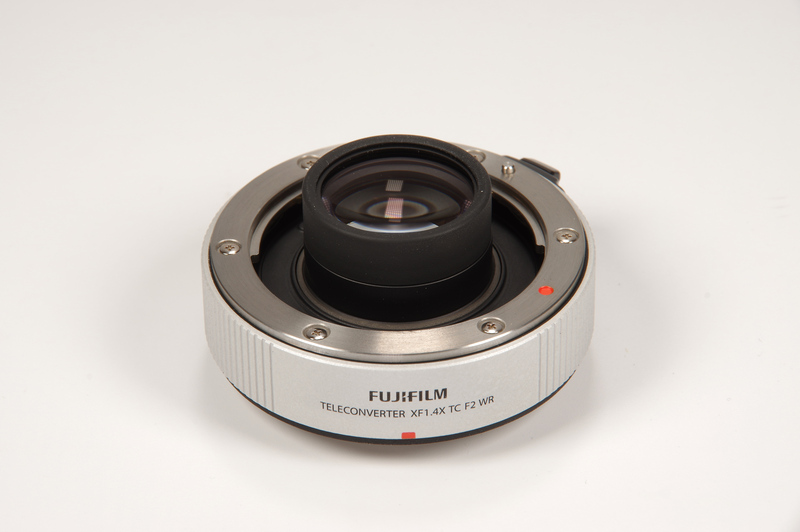 The magnesium alloy finish of the lens and converter suggest a package intended for hard use. There is much attention to detail, and, for example, the colour of the finish is intended to improve resistance to heat and reflectivity when used in the field. The quality of construction is excellent throughout. In terms of focal length, Fujifilm of course use APS-C sized sensors, so the lens on its own has a field of view similar to a 305mm lens on a full frame camera, the "35mm equivalent". With the TC this becomes 427mm, which does extend the usefulness considerably. The aperture of f/2 for the lens alone gives the potential for shooting with a lower ISO value, or a higher shutter speed, and sometimes may make the difference between getting any shot or not. The APS-C format does result in around 1 stop more depth of field than a full frame sensor, a slight disadvantage if looking for selective focus, but an advantage if seeking a bit more DOF to bring all of a subject in focus. In any event, with a long lens such as this, there is plenty of opportunities to throw backgrounds out of focus. A final point is that Fujifilm suggests always turning off the camera before removing the lens, as doing this locks the internal parts and presumably makes it more secure for transport without damage.